Samitivej Hospital Srinakarin is a medical center specializing in the treatment about spine. As a pioneer in spinal injury treatment, we utilize the latest innovative techniques to treat all types of spinal injuries, including those which require surgery as well as those that do not. 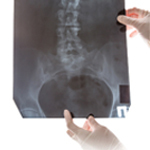 With several years of experience in providing accurate treatment of spinal injuries, our medical experts are highly regarded both domestically and internationally. Assessed under the Clinical Care Program Certification (CCPC) guidelines, an American institution which has awarded accreditation for the high standards maintained at our hospital since 2009. 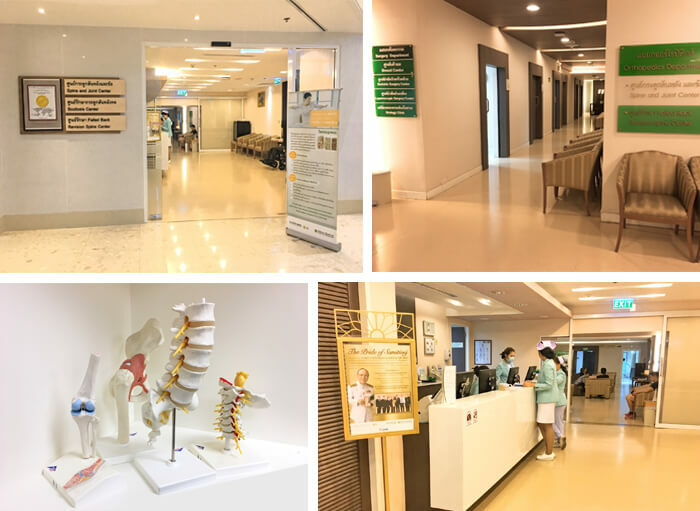 Led by Prof.Emeritus Charoen Chotigavanich, M.D., a doctor with over 40 years of experience in spinal care and a former president of the Asia Pacific Orthopedic Association, our team of medical professionals are experts in dealing with spinal scoliosis. Spine and Joint Center provides care for patients experiencing all types of neck and spinal disorders. The treatment is carried out by a team of medical professionals using the most up-to-date equipment available. Whether the patient is in need of surgery, or another form of non-surgical care, our team will make detailed assessments on each individual case to determine the cause of the problem, as well as to evaluate which type of treatment is most suitable. Understanding that the final judgment is of the utmost importance, we ensure that all decisions are meticulously thought out with patient safety in mind. Osteoporosis tends to occur in elderly people and women at the age of menopause, although it can be due to other causes, such as the continued use of certain medications. Depending on the symptoms, there are many forms of treatment, such as a combination of medication and a back brace. In more severe cases, surgery and ‘cement injections’ (Vertebroplasty) may be used, where a replacement bone substance is injected into the vertebra to help stabilize it. The treatment takes 1-2 hours and can help relieve back pain and stop compression fractures of the spine, without any risk of heavy blood loss, due to the small incisions that are required to perform this procedure. With minimal postoperative pain and stress, patients can return home after just one night recovering in hospital. Radiofrequency treatment is a procedure using Disc Nucleoplasty technology, a form of Minimally Invasive Surgery (MIS). The method uses radio waves to reduce pressure on herniated discs, without damaging the surrounding tissue. The advantage of Radiofrequency treatment is the reduced loss of blood as no major surgery is required. Treatment is very short, lasting only 20-30 minutes, with patients able to return home afterward and go about their lives as normal within 1-2 days. Endoscopic surgery is another form of treatment for severe Lumbar Herniated Discs which require surgery. Implementing innovative endoscopic surgery (Micro Endoscopic Surgery), this innovative procedure helps make treatment easier due to the high magnification camera. This allows surgeons to see small details clearly, thus avoiding any problems occurring with the delicate structure of the spinal cord. The benefits of this form of treatment are that the surgical incisions are small (1.8cm); the recovery time is short; and it is a highly effective, precise, and safe form of treatment. Our Center also uses a Navigator System, which is a computer-guided technology that makes analyses during surgery to assist in making the best surgical decisions possible, in real time. Teams of Physical Medicine and Rehabilitation Specialists, as well as trained physical therapists, highly experienced in providing rehabilitative care for patients with spinal diseases, and who offer continuous advice both before and after surgery to completely restore the capabilities of the patients’ bodies. Professor Emeritus Charoen Chotigavanich, M.D. Clinical Professor Surin Tanapiputanasiri, M.D. Assistant Professor Monchai Ruangchinikom, M.D. Assistant Professor Visal Kantaratanakul, M.D. 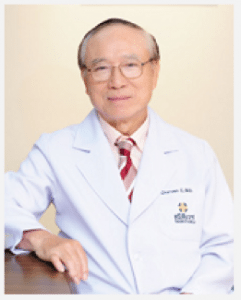 Professor Emeritus Charoen Chotigavanich, M.D., Senior Director of the Orthopedic Surgical Department, was made President of the Asia Pacific Orthopedics Association for a 3-year term from 5th October 2012 to October 2015.